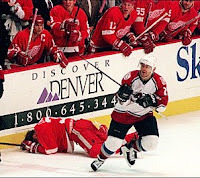 On May 29th in 1996, Colorado Avalanche cheapshot Claude Lemieux checked Detroit Red Wings grinder Kris Draper face first into the boards in Game 6 of the Western Conference Finals igniting a fierce rivalry between the teams that remains to this day. The hit hospitalized Draper with a concussion, broken nose, fractured jaw, and shattered cheek and orbital bone requiring extensive facial reconstructive surgery, several stitches, and wiring shut his jaw. Lemieux received a five minute major and match penalty to which the NHL added a two game suspension and $1000 fine. Colorado won the game 4-1 closing out the series that night 4-2 en route to their first Stanley Cup Finals appearance sweeping the Florida Panthers. Draper didn't return to hockey until midway through the following season.